Next time you’re in a city, examine the way that modern buildings are constructed. What do you see? Repetition, and lots of it. A huge part of the built environment is constructed using repeated modular components. This makes modern architecture an ideal candidate for 3D modelling. Whole buildings can be created with just a few objects, and when combined with procedural modelling techniques, you can very quickly populate entire scenes in your 3D art, which are easy to update and fast to iterate. The RailClone plugin for 3ds Max is ideal for this kind of task. It enables you to define simple construction rules to generate one-dimensional and two-dimensional arrays using a node-based interface. Because RailClone automatically instances geometry and render time, the source meshes can contain a tremendous amount of detail with little impact on render times and memory consumption, even if the scene contains millions or even billions of polygons. 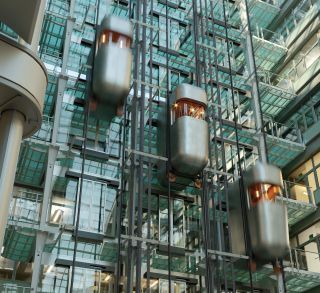 In the video tutorial below, we’ll use a scene by Bertrand Benoit to explain how RailClone can be used to model architecture inspired by Ludwig Erhard Haus, better known locally as Gürteltier (Armadillo) or Berlin’s Chamber of Commerce. We’ll examine techniques to make an almost entirely procedural modular atrium by creating glass facades, a detailed elevator shaft, plus a skylight and tiled floor. Even though modular design exists all around us, an issue when reproducing it in CG is that repetition can start to make scenes look unrealistically perfect. To make the environment appear a little lived-in, we’ll finish up by examining how to randomise open windows and blinds in the windows as well as adding texture variations to the marble floor. The written version of this tutorial appears in 3D World magazine issue 235. Buy it here or subscribe now.